New larger stock quantities made in brand new molds to meet growing demand! ANVER now offers 350+ replacement suction cups and vacuum cups that can directly interchange with or replace P-Style products at lower prices. All items are dimensionally identical for exact replacement. As we use the the highest quality rubber compounds and latest mold technology the fit and finish of our cups is top quality. The linked pages below feature the cups in large clear photos (click on the thumbnail size photos on each page) so you can see the quality. You will see it is possible to get a better product and save money. While black neoprene (NEO) versions are identical, ANVER’s silicone (SIT) versions are one step up in quality. Rather than using a red silicone containing a dye as P-Style uses, ANVER supplies a clear, translucent silicone which is dye-free, non-marring and food-grade approved. Note: The FC, BF and OC Series Vacuum Cups are currently under development and will be available shortly. All ANVER products contained herein are fully interchangeable with P-Style products. ANVER’s products are proprietary to ANVER and are of equal or higher quality than the corresponding P-Style product. In most cases the visual and functional difference between these parts are indistinguishable. 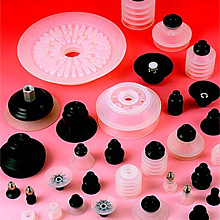 As with all ANVER products, these vacuum cups, suction cups and vacuum components are built to exceed or match the competition and to offer you a higher value.